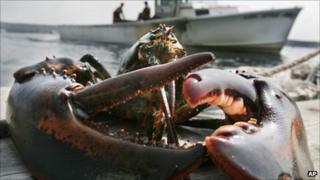 While overfishing threatens fish stocks in many parts of the world, Maine's lobster population keeps on growing. It's all thanks to a few simple measures that ensure adult males and females get plenty of opportunity to meet, and reproduce. Rush hour starts early in Boothbay Harbour. Newcomers to this little town in Maine are woken by diesel engines at half past four in the morning. It is not the roar of trucks but a low throb and thrum. After a while it is reassuring, restful - the sound of the lobster boats heading out. They are not large - about 35 feet long (around 10 metres), some crewed by their owner alone, most with one hired hand, the stern-man. They stream out in the morning and come home in the evening, like city commuters. But the lobsterman's commute is more impressive - past rocky islets, under ospreys nesting on marker poles, surprised by seals suddenly alongside, porpoises and sometimes mighty whales. Do not be deceived by the small boats. The fishing effort here is immense. From the shore out beyond the reefs and islands, the surface of the sea is dotted with brightly coloured cylinders 1ft (30cm) tall, curving to a point at the bottom, each with a short pole sticking out of the top, like giant anglers' floats. Attached to each of these thousands of buoys - boo-ees, they call them here - is a pair of lobster traps. "There are more than 200 boats in the area," Glenn Townsend, the assistant harbourmaster tells me, "each licensed to set up to 600 traps, and they tend to fish to the limit." I could not see how the lobster stock could withstand the onslaught. But Finn Carroll, sternman on the Optical Illusion, says the lobster population is growing, because of - rather than in spite of - the fishing. "There are strict controls," Finn explains, over a Dogfish Head (that's a beer, not a seafood delicacy) in Robinson's Wharf. "If we catch a berried hen, a female carrying eggs, we cut a v-notch in the right flipper next to the middle of her tail. Then we put her back. You can't land a notched lobster." It takes two moults for the notch to grow out, so the female has a chance to spawn for at least another two years. "As well as hauling the traps, extracting the lobsters, re-baiting, and setting them again - it takes a couple of days to do them all. I spend my life measuring lobsters," Finn says, wearily. "They have to be 3.25 inches (8cm) from the eye socket to where the tail begins. Any shorter, they go back." Many fisheries have minimum size limits. In Maine, there is also an upper limit. If a lobster is more than five inches (12.5 cm) from eye to tail, it goes back too. Many will be male so, as well as a high proportion of breeding females, this ensures there are lots of big, mature males scuttling about the seabed. Boothbay lobster traps are carefully designed - for the comfort and safety of crustaceans. They will not damage their claws on the way in, and the bars are spaced so that the little ones can come and go. To avoid "ghost fishing", one wall is biodegradable so, should a trap be parted from its boo-ee and lost, its inmates will be able, after a bit, to stroll free. I think, in my next life, I would like to be a five-inch-plus male lobster in Maine - as much food as I can eat, with all that bait, lots of girls and always a lobster trap handy to shelter in from predators. "If it wasn't for us, there wouldn't be nearly as many lobsters," Finn says. "They're usually solitary, fighting for scarce food, even eating each other. What we're doing is more farming than fishing, really." He and Nick Hawke, who owns the Optical Illusion, have just unloaded their catch: 800 lobsters, weighing more 1,000lb (around 500 kilos). At $2.75 (£1.75) per pound or $6 (£3.80) a kilo, that is a good day's work. So it is no wonder that lobster fishing in Boothbay Harbour is not the easiest of industries to get into. The number of permits is limited. Sons tend to take over from their fathers. But if you serve your time (at least two years) as a sternman, there is a chance you will get one. There is a lot to learn - the lore as well the law. Each lobsterman's buoys are painted differently. I show Finn one that I found washed up. He knows whose it is immediately. Theoretically, lobstermen can set their traps anywhere. In reality, people have territories and, if one person intrudes on another's - as might have happened here - his gear will be cut. As well as the chart in his boat, the lobsterman carries another in his head. Cutting gear is one thing, stealing lobsters from another fisherman's traps quite another. Finn tells me of a lobsterman with an expensive narcotics habit who was caught doing this. Fisheries protection officers coated a suspicious fisherman's trap lines with an ink that shows up under ultraviolet light. The culprit's hands glowed a guilty purple. "He lost everything," Finn whispers, "his license, his boat, everything. He had to leave town."